Kitchen Remodeling: Welcome to Our New Website! Welcome to the new Kiba Studios website! We’re happy that you’ve taken the time to explore all of the resources our website has to offer. In our first entry, we’ll provide you with a bit of information about who we are and what you can expect when you work with our kitchen design experts. Getting started with a bath or kitchen remodel in Twin Falls, Long Island, or any of our other locations couldn’t be easier. You can get started with an estimate and design your dream kitchen through our website, and you can also come to one of our showrooms to view our remodeling products for yourself. We look forward to working with you soon! At Kiba, we believe that the kitchen is the heart of the home. Between cooking meals each day and entertaining your friends and family, you spend a great deal of your free time in the kitchen. We believe that a space this important should be both functional and eye-catching, and that’s why we’ve stocked our showrooms with state-of-the-art products and hired talented kitchen designers. 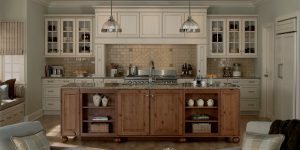 Whether you’re looking for a simple kitchen cabinet upgrade or a ground-up remodel, we’re here to help you create a kitchen that tells a story. Start telling yours today! While you certainly spend a great deal of time in the kitchen, the bathroom is where you begin and end each day. The bathrooms in your home are intimate and personal spaces, and as such, it’s important to make sure that they reflect your tastes and design preferences. We can help you with anything from custom bathroom cabinets to full-scale renovations, so come by a showroom near you to meet with one of our bathroom design experts! As kitchen and bath remodeling experts, we know just how important is to choose the right team for the job, no matter how large or small the project may be. You’re investing time and money into your home, and you can’t afford to settle for anything but the best products and designers. We also know that you have a busy schedule, so we’ve made it as easy as possible to get started with a remodel from the comfort of your own home. You’ll find Kiba Studios located inside of familiar names like Carpet One Floor & Home®, and the same expertise and value you’ve come to expect from our partners extends directly into our showrooms. Get Started With a Bath or Kitchen Remodel Today! We can’t wait to help you get started with your remodel! You can visit this page to answer a few easy questions, and one of our talented designers will promptly respond with an estimate and provide you with information about your next steps. If you’re ready to jump in and design your own kitchen, then be sure to visit this page to start your remodel online. After you’ve made your choices, you’ll make an in-person appointment at your local Kiba Studios.